The Real Madrid ace joined world No1 Rafael Nadal to play a unique tennis match for Nike's latest advert. But while Nadal used his usual racket, Ronaldo donned his new boots to show off his silky footwork to take on the Spaniard. The shocking pink Nike Mercurial Vapor VIII — built for their explosive speed — proved a smash hit for the former Manchester United star. 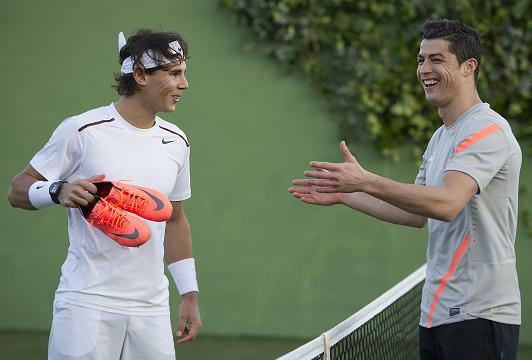 Ronaldo said: "Filming with Rafa is something different — me with football, him with tennis. It was a pleasure. I really enjoyed it." The goal machine admits he is a big tennis fan and Real supporter Nadal is his favourite player. He added: "I love tennis. Not just me but some of my family, like my brother who often travels with me. "It's a sport I really like aside from football. " Nadal, who has won 10 Grand Slam titles, said: "I am always watching football and could watch Ronaldo and his team-mates all day." You can watch the pair in action in our brilliant video exclusively first with SunSport on our video player below.